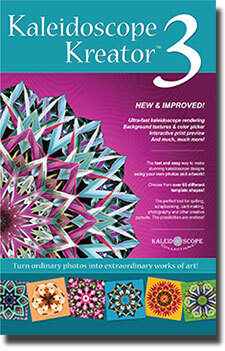 Making kaleidoscope designs has never been so easy or so much fun! You'll be amazed at the intricate and beautiful designs that you can create with just a few clicks of your mouse. Kaleidoscope Kreator 3 has been completely redesigned from the ground up to be faster, easier to use, and packed with new features that our customers asked for. Choose from over sixty-five different template shapes to create the perfect kaleidoscope for any project. Extend your template choices with add-on Template Packs. Add a custom background color and texture with the click of a button. Save snapshots of your works-in-progress to retrieve and work on later. 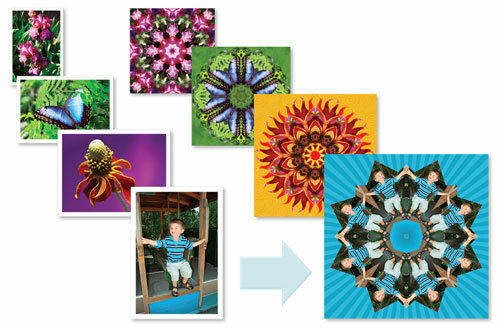 Print multiple kaleidoscopes on the same page - perfect for cards and patterned paper. Print large-format kaleidoscopes using a standard-sized printer. Works with JPEG, PNG, TIFF and BMP image formats. Kaleidoscope Kreator is the perfect tool for quilting, scrapbooking, papercrafts, and so much more. Visit our idea gallery for inspiration and examples.